mama elephant | design blog: Mama Elephant is Celebrating 5 Years! Stampede Day 3! 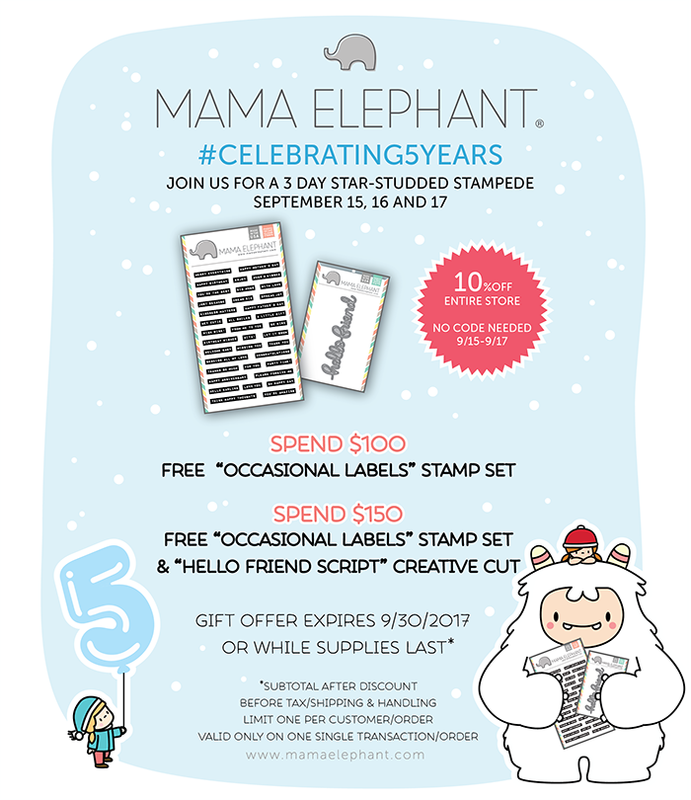 Mama Elephant is Celebrating 5 Years! Stampede Day 3! 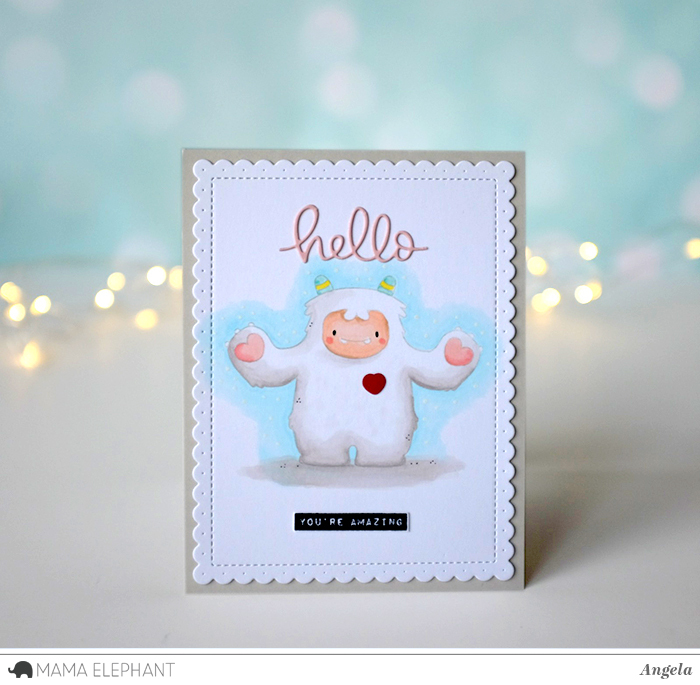 Welcome to the very special #celebrating5years with Mama Elephant Design Team blog hop! This is Day 2 of the 3-day Stampede! Make sure you check out Day 1 and Day 2 if you missed them! For Day 3 of the Stampede, Angela used some soft colors to color this sweet yeti. Don't you just want to give him a big hug? He thinks you're all amazing! This wraps up our 3-day Stampede! There is a lot more inspiration coming your way from our Design Team all month long, so stay tuned! We hope you love the new products as much as we do! Thank you again! So wonderful and inspiring project ad always. Oh my! your No line Yeti is ADORABLE!! thanks so much for sharing! and HAPPY BIRTHDAY MAMA ELEPHANT!!! Happy 5 Year Celebration! Love your products!! Keep them coming. This has been such a fun stampede with so many amazing designers and card creations. I'm loving the Yeti and thanks for hosting such a great giveaway. Super adorable and wow on the no line coloring! The more I see that Yeti...the more I love him. So adorable! The Yeti is so cute! I cannot get enough of him! I am obsess with the Yetis! what an amazing card! beautiful work! This card is so adorable... love the no line coloring. I'll have to wxperiment with that watercolor look. It's so beautiful! So ready for this yeti! Oh my I love the card, the no line coloring is awesome. I am just not that great at it, but it really does make the images so real, awesome job to her! The no-line coloring is awesome! Great card! Angela's card is a beauty ! happy 5 years! thanks for the continued inspiration! Cute hugging Yeti card. Thank you for sharing. Great blog hop. Love that super cute Yeti!! Thank you for all the wonderful inspiration! HBD ME!! That Yeti is so adorable! I am off on a new adventure! Can't wait to see what these folk have done! Thanks. Congratulations on your first 5 years. Put my order in! Can't wait to get the Yeti set. What a cute card. There are so many great things in this release! Super Adorable card!!! I NEED everything from this release!! I haven't tried no line coloring ywt, but I love how it gives the yeti a whole new look. It is fantastic! I love no-line Yeti. What an adorable card. The coloring is awesome. So cute with the soft colors! Such an adorable card! I love the Yeti :) This has been such a fun and inspirational Stampede!! What a fun blog hop and a cute card! The yeti is so cute! Sooo adorable, always love ME products. Happy 5th! Oh my , another absolutely adorable card with this cute yeti! I love ME products, and this release is just awesome! Oh such a cute and sweet card. Love the Yeti. He is sooo adorable. Happy 5th Anniversary! Such a cute yeti! Love how the face is colored!! Such a cute card! This yeti is adorable. happy celebration of 5 years! The yeti is such a cute Stamp Set. I love how you used it for a no line effect. I already liked you on Face Book so I shared your birthday Stampede post. The Yeti is just adorable... love the soft look and no-line technique. Wonderful card, love the sweet coloring! Very cute Yeti. I like the heart. The yetti looks so furry and huggable. I really love the coloring on this Yeti card, so pretty! This Yeti isn't scary at all, but warm and cuddly. The soft background gives him a friendly outlook, and his open arms beg a hug. How cute! This is the most adorable Yeti that I've ever seen! What an absolutely adorable Yeti! Happy 5th!!! Love it all!! Fabulous no line coloring! I like and follow you on fb. Super cool card! Love the soft colors and the no line coloring on the Yeti. Winderfull no line coloured yeti. This yeti is sooooo cute! Adorable Yeti! Love the soft colors and blue background. This Yeti is so sweet! I just want to give him a big hug! I follow you and tweeted about your new release again today. I follow you on IG but I don't know how to repost about your new items. This yeti is soooo cute!!!! OH my gosh I need that Yeti!! So cute and happy! The yeti is too cute! Congrats on 5 years! great release! Love all the new stamp sets. What an awesome release!!! Love love love it! Gotta have them all!! What a fabulous card - the colouring is just amazing! I like ME and have shared on Facebook. I follow ME on Instagram and have shared! The colouring on this card is so perfect. Just stunning. Thanks for the inspiration. It was three awesome days !! Thanks !! I knew ME only 2 years ago, in a scrapbooking exibition. and I loved the designs. 1. Oh my!!! I'm in love for those cuties new Yeti stamp set!!! Love this card!!! Such fun stamps & amazing cards from your designers!! What an amazing and awesome release!! Such an adorable card!! Awesome release!! That cute little Yeti makes you want to hug him. Great card, love the coloring. great new releases. the yeti is adorable but my favs are the little santas and deer. What a cute yeti card! Love how you grounded him (her?) with the shadow - makes it look more realistic. Thank you for the chance to win! Who knew a Yeti could be SO cute. I just love the look of the no line coloring on this Adorable Yeti!! The Yeti Stamps are so cute, thank you for sharing great inspirations. What an awesome release! You guys have outdone yourselves again! Can't wait to get my hands on these cuties. Yay for day 3! I love this release and the wonderful inspiration! Okay, this yeti is just adorable. Another fabulous release and some awesome creativity and inspiration!! Fantastic no line coloring! What an incredible new release! This is gorgeous. I love the colouring! I just love this release and must have these yetis! The yetis are so cute. Just love your little animals. I'm very new to this crafting. Love them all. Wonderful no line coloring! Love this! Playing online casinos provides the best experience possible. G club A betting site that will allow all wagers to complete with the selected bet. Make profits to gamble on every single day with selected gamblers. Always give good returns. The profit is very high. Gambling and gambling with the best to play. The return of the lot. I want to bet on gambling that is realistic, easy to play, to always play gambling luck.